Coming down with a stomach bug is about as fun as listening to your crazy cousin who you only see once a year on holidays rant about conspiracy theories and politics: it’s painful, uncomfortable and embarrassing and the situation presents itself with little warning, lasting anywhere from a few hours to several days. Commonly referred to as the “stomach flu,” this illness is actually a condition called gastroenteritis. Here at Innovative Express Care we see cases of it year round, but more often in the winter months. About 80 percent of people come down with the stomach bug between November and April. Gastroenteritis is usually caused by a virus in the stomach or intestines, but bacteria is sometimes the culprit. That leftover tuna that smelled a little off? Yep, should have tossed it. No matter if it’s bacterial or viral, the signs of a stomach bug are the same: nausea, abdominal pain and cramps, vomiting, loss of appetite and diarrhea. Other symptoms you might have are chills, sweats, fever or muscle pain. The first few days are usually the worst and then the symptoms tend to taper off. The enforced weight loss is a total bonus. What should you do if you think you have the stomach flu? Stay hydrated— try sipping water or broth slowly, or sucking on ice chips. Avoid acidic drinks and caffeine. Add bland food gradually as the body tolerates it. Stock up on pre-moistened wipes and reading material for the bathroom—you’ll be spending some quality time in there. If vomiting and diarrhea continue more than a few days, or if you have bloody stools or symptoms of dehydration, it’s important to seek medical advice. 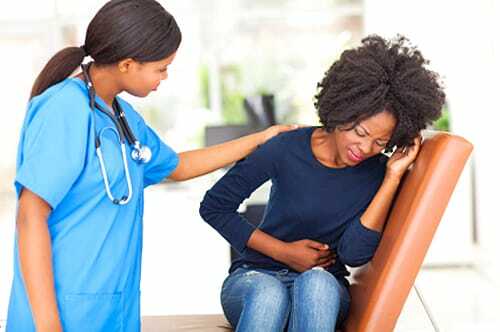 Sometimes gastroenteritis can lead to other complications or is symptomatic of another underlying medical condition. Our urgent care doctors at Innovative Express Care will offer you sound medical advice and answer any questions or concerns… We have IV fluids here, take insurance, and we have a very affordable IV fluid self-pay rate! Don’t share drinks or eating utensils with others. Any plans to Netflix and Chill with sick “friends” should be postponed. Be careful drinking water when traveling to other countries—only drink bottled water or other sealed liquids (skip the ice cubes, too). If someone in your house is sick, be sure to disinfect surfaces, use separate towels and limit contact until they feel better. You may want to consider selling your house to get away from the germs, although that may seem drastic to some. Let the next people deal with it. We offer both high-quality urgent care and primary care services with short waits for appointments. You won’t be sitting for hours in an office waiting room at our clinic—unless you need the free wifi and like relaxing in front of our big-screen TV. Our doctors communicate with patients through telemedicine, scheduled appointments or walk-in visits. We offer IV fluids, nausea medications, and antibiotics if we feel it was something you ate. We are discreet, affordable and convenient—you can even book your appointment online! Let us help get you on the path to recovery.